“To our illustrious founders some 100 years ago who included Einstein, Freud, Buber, Weizmann and Ahad Ha’am the progress, achievements and global standing of the Hebrew University of Jerusalem would have been unimaginable”. Addressing a gathering of over 200 British Friends’ guests at Claridge’s ballroom and looking back over the University’s remarkable history, its President, Professor Asher Cohen added that the next decade and beyond boded well with growing internationalisation, stronger connections with industry and the City of Jerusalem and focus on areas such as computer science. He also expressed commitment to address the need to attract and retain more students from Israel’s minority communities; “all this”, he commented, “while retaining our academic and research excellence”. Guests were treated to a Jerusalem culinary experience with leading Israel chef and restaurateur Assaf Granit, himself a Jerusalemite, partnering Tony Page to bring the tastes, smells and colours of Jerusalem cuisine to London. Hebrew University students all recipients of scholarships from UK donors, featured in movies screened on the evening and several were present at the gala itself. 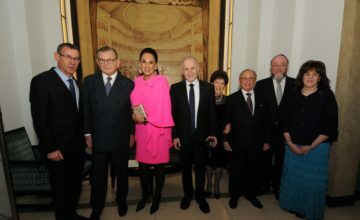 Speakers included Chief Rabbi Mirvis and Israel’s Ambassador Mark Regev as well as Assaf Granit. Ambassador-in-waiting, Neil Wigan OBE, Britain’s next Ambassador to Israel also attended along with his wife, Yaeli. The British Friends of the Hebrew University dates back to 1926, since when, the charity has been continually involved in all aspects of the development of the Hebrew University. At the gala dinner event, the gathering expressed further commitment to the future of the University. The evening raised funds for further scholarships under the campaign title ‘A hundred scholarships for a hundred years”.